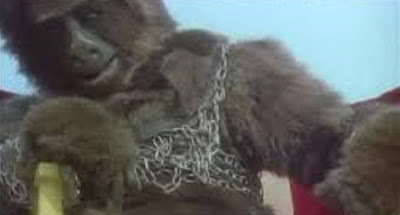 Queen Kong (1976) could arguably be considered a low point in the King Kong story, though there are some other contenders too (see: King Kong Lives ). Still, Queen Kong is an intriguing chapter, for certain. To describe it briefly, the film is a bawdy, distaff parody of Kong’s classic narrative and, in some ways, a forecast of what was to come, cinematically, in terms of films such as Airplane! (1980) or The Naked Gun (1988). Unfortunately, for all its ambition and undeniable creativity Queen Kong is poorly scripted, acted, and visually rendered, with some genuinely terrible effects coming into play. Some of the film’s humor is really juvenile too, and even borderline offensive. The whole approach to comedy is scattershot, but I would be lying if I failed to note that some jokes absolutely hit the mark. Unexpectedly, Habit finds her man in Ray Fay (Robin Askwith), a poor man who has just stolen a framed King Kong poster from a London collectors’ store. She pays for the poster, and enlists Fay to be her star. He readily agrees. They travel together to remote “Lazanga” and soon run afoul of a native community of beautiful women, and the God they worship, who lives behind a giant wall, Queen Kong. 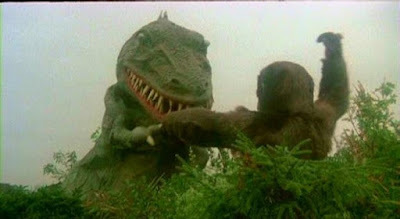 Queen Kong immediately takes a liking to Ray, and defends him from the prehistoric menaces of the jungle. Kong’s affection for Ray allows Luce to capture her and bring her back to London. There, Queen Kong becomes a pop culture celebrity, but instead of being killed, is sent back to Lazanga (by boat), after climbing Big Ben. 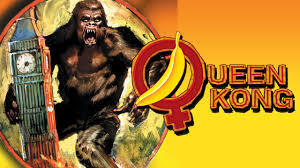 Queen Kong aims to be a joke-a-minute extravaganza, where anything and everything gets thrown against the wall -- movie parodies, linguistic puns, social gadfly commentary -- to see what sticks. This is, make no mistake, the exact approach adopted by Airplane! (1980), a few years later. It’s just that Airplane is such much more consistently funny, and better visualized, than Queen Kong is. But, ambitiously and impressively, Queen Kong seeks to be a general lampooning not only of the Kong Cinematic Myth, but of all 1970s cinema. My synopsis above mentioned “Last Kanga in Lazanga,” a joke title riffing on Last Tango in Paris (1972). 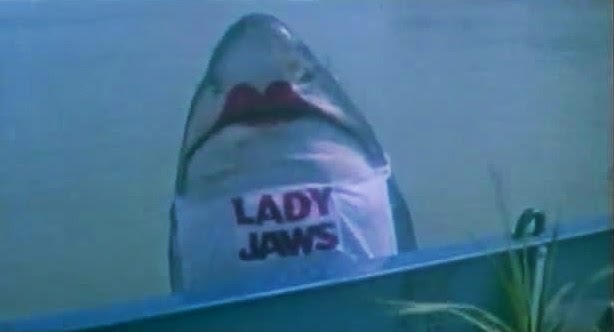 But the film also features a joke about Jaws (1975), with a shark, named Lady Jaws, attacking Habit’s ship. Lady Jaws actually wears a bib with her name on it! Later, there’s a native guide whose head spins all the away around, and she spits pea soup…just like Regan (Linda Blair) does in The Exorcist (1973). Again and again, then, the film pokes fun at the major pop-culture touchstones of the first half of the disco decade. Other, less timely productions also get ribbed, including Tarzan, the basic idea is to go after the blockbusters of the era. And then, on a totally different tangent, some of the jokes are purely political. It is observed of a pterodactyl that Queen Kong fights that it is “all teeth…just like Jimmy Carter.” And at one point, Queen Kong also destroys a Ronald Reagan film festival, a good example of positive destruction, given the overall quality of the actor’s catalog. Ironically, Airplane also makes jokes about the Carter Administration, and Ronald Reagan’s acting career. Clearly, these were widespread sources of humor in the mid-to-late seventies. Queen Kong falters a bit in its depiction of the native tribe, and the “ooga booga” language it ascribes to them. In the 1970s, this was not considered inter-culturally insensitive. Today, it clearly would be considered such. Just because a language sounds funny to our ears, it is not nonsense. It just arises from a different context and basis. Of course, the film’s biggest target is the inherent sexist nature, perhaps, of Hollywood storytelling in general, and the Kong myth in particular. If you flip the sexes of the main characters, as this film does, the story seems absolutely absurd on its face. Luce can’t find any suitable man, apparently. There isn’t one who fits her ideal of a male with courage, and sexiness. All the men are too “delicate” to endure a long voyage to Africa, and then a trip through a dangerous jungle. She finally finds Ray Fay, and dresses him in ridiculous, revealing costumes. Naturally, all the women on the film and ship crew treat him as an object of lust and desire. He isn’t seen as a capable person, or an independent one. He is an object of passion and lust that must be protected from the environment, and his own weaknesses. Seen in this light, one realizes how antiquated some of the King Kong concepts truly are. The film is successful in the sense that its modus operandi, flipping the sexes of the characters, exposes something about the original film, and its narrative and themes. But the special effects are terrible, the musical numbers are grating, the acting is over-the-top campy, and prevents investment in the storyline. Again and again, I have to come back to the idea that Queen Kong is an early (and therefore notable) instance of Airplane-style movie-making, but that it is a poor example, scattershot and largely unfunny. More often than not, the movie really misses the mark. That fact established, I enjoy the fact that this movie’s giant monster, Queen Kong, gets a happy ending. She is returned home, to live out her life. It’s nice, once in a while, for a giant ape to not to get killed by human kind after human kind drags him/her out of his home. An interesting look at a film I'd never heard of. From your review, I'll skip on this one. "The Mighty Peking Man" is probably a more enjoyable parody of Kong. Queen Kong joins the company of other such unfunny sci-fi comedies as "Galaxina" and "Flesh Gordon and the Cosmic Cheerleaders". I'm sure I'll never watch this film, but I appreciate the detailed review and analysis. Very thoughtful observation about the sexism built into most "King Kong"-type stories. I don't know what took me so long to find it, but this is currently my favorite blog, anywhere. Thank you. Thank you for such a supportive comment. It means a lot to me that you are enjoying the blog! I love this silly thing. Tremendous fun. I especially love the hilarious bit with the Indian National going on about how it's the fault of foreigners and how a "British" ape would never do this.